So far we have four pages on the topics of resistors and terminations, but we've only scratched the surface! What's so special about microwave resistors? Axial-leaded resistors, the ones with the color-coded rings that you might be familiar with from misspent youth of busting stuff to "see how it works", are not going to work at microwave frequencies. This is because you have to consider that anything with dimensions longer than perhaps a sixteenth wavelength acts as distributed element. 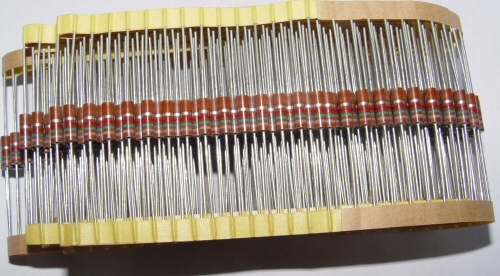 It is desirable for a resistor to behave like a lumped element in most microwave applications. The problem that resistors have at microwave frequencies is that in order to be considered a lumped element, they must be physically small, but they must also be sized in order to dissipate power.